"2015 marked the 63rd Anniversary of Walsh’s Pharmacy in the County of Wellington North… and what a proud history it has been." Founded in 1952 by John Walsh, Walsh’s Pharmacy has been a mainstay business, and health care provider, in the Village of Arthur, for well over 60 years. In fact, 2017 will commemorate our 65th consecutive year in business, and a milestone in family-owned businesses in Ontario and Canada. Walsh’s Pharmacy has experienced multiple growth surges and store expansions over the years, beginning in 1955 with the construction and relocation of the original business to a larger location. This new and larger store proved to be the home of Walsh’s Pharmacy for the next 53 years, during which time 2 more additions were incorporated into an ever-growing business enterprise. Continuing the family tradition in pharmacy, current owner (and son), Joe Walsh, who had been involved in the family business since elementary school, entered the University of Manitoba, and completed his studies, graduating from the Massachusetts College of Pharmacy & Health Sciences in 1991. Joe and wife Cheryl (General Manager) purchased the business in 1992, and have continued to operate Walsh’s Pharmacy from then to the present day. In 2008, the business again had to expand and a decision was made to move into a new, vastly larger, and more modern facility to help meet the ever-expanding needs and expectations of a growing community, where it stands today. 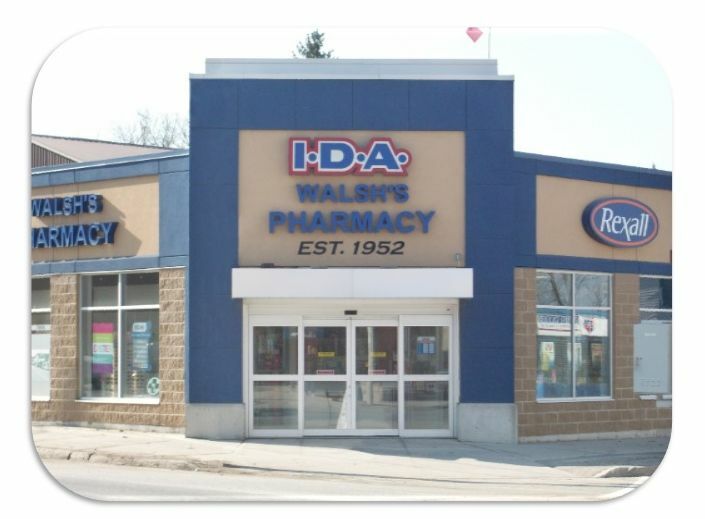 It’s been said that "Luck happens when preparation meets opportunity”, and in 2014 Walsh’s Pharmacy was presented with an opportunity to acquire a competitor business in Mount Forest, just 28 kilometres away. 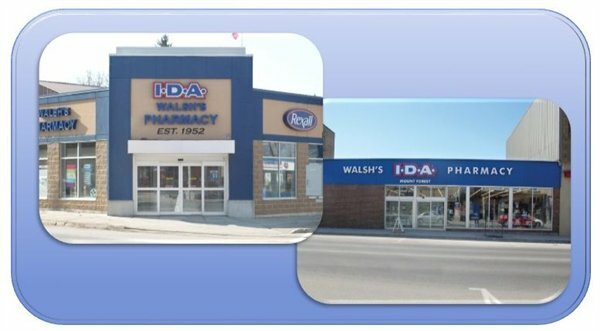 After much behind-the-scenes hard work (the preparation), Walsh’s Pharmacy succeeded in acquiring the business, and launched Walsh’s IDA Pharmacy in November 2014… just in time to celebrate Christmas in the community of Mount Forest. With the now expanded 2-store location as a springboard, Walsh’s Pharmacy has been able to provide an even more and vastly enlarged product and service offering to an ever-expanded customer base. This expanded product and service offering includes baby needs, non-prescription medicines and remedies; from hair and skin care products to weight loss/management programs. and patient catalogue to meet the changing community demographic. expanded facilities, upgraded programs and services, have been developed to continue to meet the needs of our customers and patients. Today’s patients are no longer simply satisfied with having their prescriptions filled with the required accurate, concise and adequate information. Since many of today’s prescription pharmaceuticals contain more than one active ingredient, patients need information about what food and beverages to avoid, as well as what medications they should not take with their medicines. And just as the role of the pharmacist has changed, so too has the medication selection which is maintained in a modern pharmacy changed. Expanded use of generic pharmaceuticals provides substantial cost savings to payers. Walsh’s Pharmacy provides patient information pamphlets as well as other medical information readily available in-store together with other patient self-information. Combined with health efficiency-improving devices like pill counters, computerized prescription-filling and patient glucometer/blood pressure monitor training, technology improvements continue to be introduced. Despite all the business growth and improvements, we continue to maintain, one key element remains constant… Walsh’s prompt, friendly service…our standard. At Walsh’s, we’re proud of our heritage and small town roots- whether you visit us in Arthur or Mount Forest, you can expect to receive the same friendly attitude and professional standards that John Walsh began in 1952.